Enjoy Canada Day in Saint John! Enjoy Canada Day in Saint John! All events are free and take place rain or shine! King’s Square comes alive at 7 am with artisanship from a variety of mediums and genres, including local entertainment. You may also try your luck at the charity bingo; this year, the funds raised are donated to Hestia House in honour of the 100th Anniversary of Canadian Women’s suffrage. We enjoy the unique feature of a three-court beach volleyball court that sits on our waterfront, adjacent to our Boardwalk Stage. What better way to enjoy athleticism and team spirit as a part of who we are as Canadians than with this annual tournament?! This event is always very well attended, and rounds out our roster to provide something for the early birds of the day! The City Market opens its doors at 9 am with over 50 unique vendors for their indoor market as one of the nation’s oldest markets. They will have a traditional Pie Poudre Court, children’s activities, and live entertainment throughout the day. The celebrations have grown to such a magnitude that we shut down King Street and King’s Square the busiest streets in Uptown Saint John and the only street of its kind in North America – to create a right of way for the Parade. Our traditional people parade always signifies the beginning of our day’s festivities, and we have expanded it to include bands and a few key vehicles. The Parade will have trolleys, antique cars, marching bands, and multicultural demonstrations. There will be dignitaries (Mayor & Council, Provincial Ministers and MLA’s, Member of Parliament – Wayne Long), Saint John Police Honour Guard, Canadian Military, Boys & Girls Club, Brownie and Girl Guide Troops, Boy Scouts of Canada, and members from various other local charities and organizations. Following the People Parade, the flag raising ceremonies take place in front of City Hall. This is where the Mayor of Saint John will present MP Wayne Long with a Canadian flag and he will raise it to the tune of our national anthem. In addition to our national flag, we will raise each of the thirteen provincial flags during the ceremonies. Once completed, the Parade is led by the Piper decked out in traditional piping tartan garb into the Market Square Atrium where the opening ceremonies take place. The festivities include opening remarks by local dignitaries, the famous 4ft x 8ft Canadian flag cake, and the singing of our national anthem and of course Happy 149th Birthday Canada! The future of our nation – the children – will enjoy a multitude of activities for the entire afternoon. Free children’s activities are offered throughout the day including face painting, cookie decorating, tattoos, flag making, crafts, pins, seedlings, bounce rides, sidewalk chalk, hula hoops, cotton candy, popcorn, bubbles, and so much more! There will be something for all ages – free of charge all day long. We will have many favourite characters with us such as Super Mario, Hello Kitty, Spiderman,and a few others. The children’s activities are set up in King Square, City Market, Loyalist Plaza, Market Square and on the Boardwalk. The huge bounce rides that have become so popular are also set up in King’s Square, Loyalist Plaza, and on the Boardwalk. Bungee jumping in Loyalist Plaza is always a hit and we are bringing it back again this year. We will be adding a Photo Booth to the festivities this year with Canada themed props. Family and friends can put on some garb and get their photo taken as a lasting memory of their Canada Day Celebrations in Saint John. 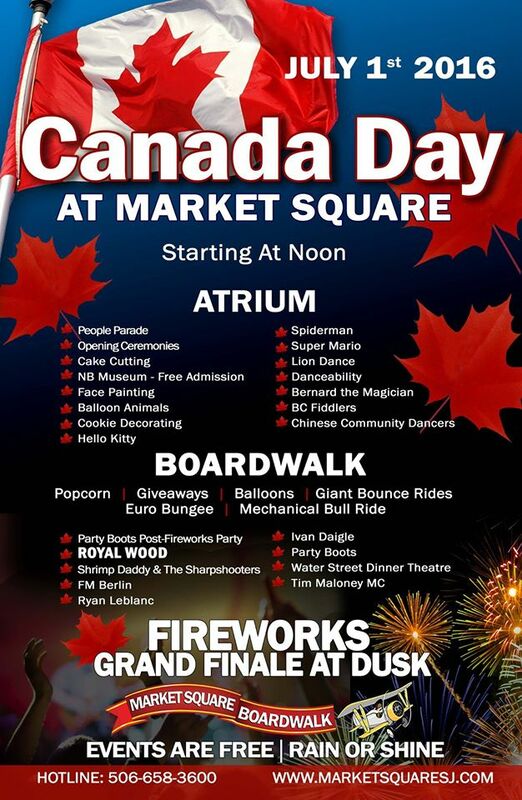 Please follow Market Square on Instagram and Twitter @marketsquaresj and post all of your amazing Canada Day photos! Today’s youth enjoy what, from their perspective, is a long tradition of the flag as a familiar symbol of our nation. Our third annual youth arts collaboration will invite students from all levels of public school districts – both Anglophone and Francophone – to tell us about the most influential Canadian in their lives. Through the written word and through visual art: Write It! or Draw It! is their call to action and winners from each category will be selected to become a part of the Official Opening Ceremonies July 1st. All entries will be on prominent display through the longest Pedway system in Atlantic Canada, which runs as the main artery through the significant venues for the celebrations. This newly minted aspect of our celebrations was immediately recognized as a resounding success. It is an opportunity for our region’s youth to engage in the arts as a means to appreciate the fundamental importance of being a citizen of this great nation. We are keen to be inspired by what these young minds deliver this year. The New Brunswick Museum will offer free admission and programming all day long to welcome everyone to enjoy a piece of our heritage. Experience stories about our rich history and natural environment, touring the Museum’s galleries and enjoying family activities. You will find fascinating fun facts about our region! One of the few surviving buildings of the Great Fire of 1877, the Loyalist House serves as a proud reminder of Saint John’s British Loyalist heritage and tours will be conducted throughout the day. Aquila Tours – a local tour operator –offers historic trolley rides throughout the Uptown area. Everyone enjoys a taste of our history and many will enjoy a leisurely ride full of historic facts about our great City. Families, spectators & skaters of all ages & abilities, be sure to join us for the 2016 Canada Day Mayor’s Cup Skateboard Competition at Station One Skate Plaza. We’ll be kicking this year’s the event off with a free P.R.O. Kids Learn to Skate Clinic at 10 am, and will have boards & helmets available for use. A free BBQ starts around noon, registration opens at 11 am & competitions will run from 12-2 pm. Saint John is known as the hotbed of live music in the Maritimes and fans will be enjoying the sounds of local and Canadian performers (dancing, singing, magic, bands, etc.) will entertain the public from 11 am through to the stroke of midnight. Based in Victoria, British Columbia, and directed by Daniel Lapp, the BC Fiddler Orchestra is open to fiddlers and other musicians aged 12-17, by audition.The BC Fiddle Orchestra began in 1994 when Daniel Lapp gathered his students and several BC mentors and accompanists’ for a performance at the Commonwealth Games in Victoria, BC. Since then it’s been a breeding ground for many of Vancouver Island’s top young violinists interested in ‘fiddle music’ to get a hold of this unique art form and learn about its great depths and traditions found around the world. The BCFO has performed extensively around BC at festivals and recorded 3 albums, the most recent, Fishcakes & Oranges released in 2013. The first two albums, originally released 17 years ago were re-mastered and re-released at the BCFO 20 year Anniversary Celebration on May 9, 2014 in Victoria BC. A 4th album featuring the current ensemble and tracks contributed by BCFO Alumni is in the works! Bernard the Magician – Local celebrity Bernard the Magician is a tradition of special events in our region. His feats are a feast for the eyes and imagination. His magic will delight all ages… he may even call upon a member of the audience as an assistant – the little ones love this part! Danceability – The entertainment kicks off with our local dance troupe – Danceability – and their beauty of movement. They have been part of our festivities for many years and are always a crowd pleaser. Each year, they travel to New York to compete nationally and have received various awards. They will perform several numbers on Canada Day. Multi-Cultural Performances – Saint John Chinese Cultural group will perform during the Opening Ceremonies featuring the Lion Dance. They also highlight various age groups with dance, singing and instrumental keeping with our Voices of Canada theme for 2016. Tim Maloney – We welcome Tim back with open arms to MC the entertainment on the boardwalk from morning until the fireworks. Water Street Dinner Theatre Performance – Our community boasts about our dinner theatres and performance artists. This year, we will welcome both troupes to the Boardwalk Stage to perform pieces from their current shows. They are always a delight with their talent and bright, colorful costumes. Uptown Ghost Gallivant – Join David Goss as he shares the stories of ghosts that have been spotted over the years near Market Square, around the harbour, in the north of Union zone, at the Burial Grounds and in Trinity Church and the surrounding preservation district. Expect evidence of the ghosts to be spotted as you walk along the waterfront. Our fireworks display at dusk is always a much-anticipated event and we have created an already much-renowned tradition with this send off with the singing of our National Anthem. Join us after the Fireworks for the Party Boots Post-Fireworks Party! ONLY FOG PREVENTS THE SHOW, in which case it will be rescheduled to the next evening that weather permits. Follow Market Square on Twitter and Facebook for the most up to date information.